Wikipedia blocked Polish readers access to its pages on Wednesday in protest over the future of EU online copyright law. This is a protest against the new EU copyright protection directive on the digital single market, said the Wikimedia Polska association in a statement sent to Polish news agency PAP. At almost 15:00 local time on Wednesday, Wikipedia shut down for 24 hours until July 5 when the European Parliament will vote on the directive implementing new rules about licenses for content. The debate has coalesced around two points - article 11 or the so-called neighbouring right for press publishers which could force Google, Microsoft and others to pay publishers for displaying news snippets. Article 13 or mandatory upload filtering would require online platforms such as YouTube, GitHub, and Instagram to install filters to prevent users from uploading copyrighted materials or seek licences to display content. "The Wikipedia protests against articles 11 and 13, which according to the creators of Wikipedia will significantly hinder the operation of the online encyclopedia,” Wikipedia told PAP. The draft document, however, excludes "non-for-profit online encyclopaedias". Proponents of the overhaul believe the regulations will help fight piracy on the web. The critics, however, say the links will not contain photos, title or even words and it will limit the freedom of expression and access to reliable contents, while allowing the spread of so-called fake news. 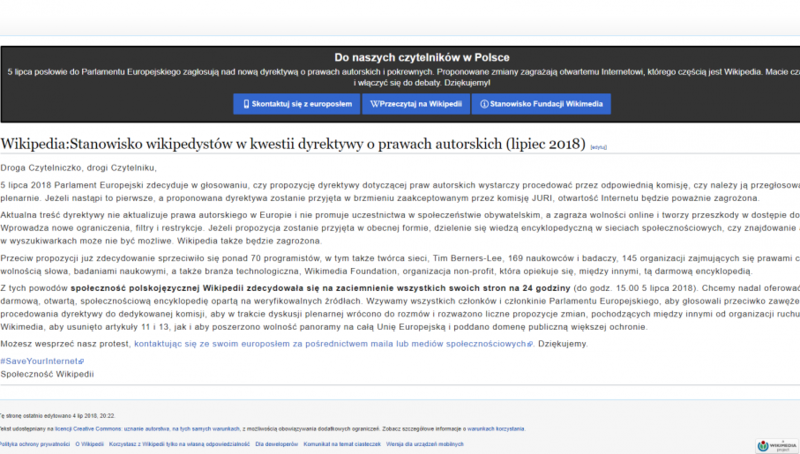 Visitors of Polish language Wikipedia on Tuesday face a note saying the new directive “threatens online freedom and creates obstacles to access to the Web”. At the bottom, there is also a link to contact members of the European Parliament to support Wikipedia’s protest. Wikipedia also shut down in Italy on Tuesday.